Hillary Clinton’s plan to dramatically boost U.S. solar power production and installation could benefit a number of companies that have paid or donated to various arms of the former secretary of state’s expansive political network. Leading solar panel manufactures and installers have donated to the Democratic presidential candidate’s family foundation, employed members of her inner circle, bankrolled a group providing policy advice to her campaign, and enlisted the services of lobbying and public relations firms run by her top supporters. The solar industry will see a major boost if Clinton is elected and enacts her newly unveiled climate and energy policy plan. Released on Monday, the plan calls for a seven-fold increase in solar power capacity by 2020. Internal discussions behind the Clinton campaign’s bullet-pointed policy outline are not known, but two senior officials at the left-wing Center for American Progress have been advising the campaign on its climate and energy platform. 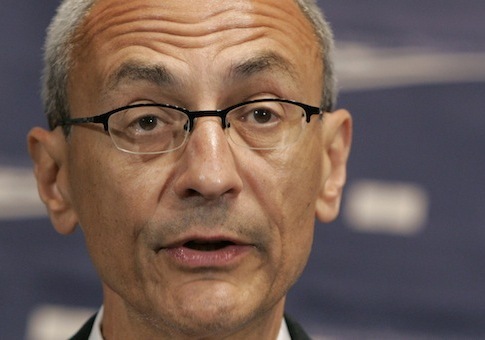 John Podesta, the center’s founder, is a long-time Clinton ally who is currently chairing her presidential campaign. William Yeatman, a senior fellow at the Competitive Enterprise Institute, sees his hand in the campaign’s climate plan. "He’s a trusted advisor, and climate change/green energy is a major issue for him. So I think we’re seeing his influence here," Yeatman said in an email. "And, given that it’s a loser issue and she’s normally very disciplined about following political winds, I think it perhaps demonstrates that Podesta’s influence is significant." Clinton’s climate strategy would likely benefit solar companies such as First Solar, whose donations to the Center for American Progress came under scrutiny after the policy group actively promoted the company’s positions on key legislative issues. "First Solar gave money to CAP and CAP’s staff advocated for First Solar before Congress and in articles on CAP’s website without disclosing that pertinent piece of information," wrote the Nation’s Ken Silverstein in a 2013 story about the group’s corporate supporters. More recent corporate donors to the group include the Albright Stonebridge Group a political intelligence firm founded by Madeline Albright, the former secretary of state, that boasts of its ability to connect businesses to Washington power-brokers. Albright Stonebridge has also represented First Solar, helping the company to secure a lucrative solar contract in China in 2009. The firm did not respond to questions about its relationship with First Solar, or whether there still is such a relationship. Wendy Sherman, a Clinton confidante, appointee at State, and former campaign adviser, was a vice-chair of Albright Stonebridge until 2011. She also disclosed payments in excess of $5,000 from First Solar for "consulting services" that year. First Solar also counted Clinton’s campaign treasurer, Jose H. Villarreal, as a board member until 2012, which irked some liberals who noted that the Walton family, the owners of Walmart, also own a large stake in First Solar. The Walton Family Foundation has given between $1 million and $5 million to the Bill, Hillary, and Chelsea Clinton Foundation. First Solar has donated between $25,000 and $50,000. Other Clinton Foundation donors include Suntech Power Holdings Co. Ltd., a large Chinese solar company that has donated between $25,000 and $50,000. Its American subsidiary has donated between $10,000 and $25,000 to the foundation. Its chief executive Shi Zhengrong has given another $50,000 to $100,000. Suntech is one of a number of large Chinese solar manufacturers bankrolling the Coalition for Affordable Solar Energy. That group has pushed hard against Obama administration efforts to tax imported Chinese solar panels, which are often cheaper than ones produced in the United States. Those tariffs artificially raise prices of solar panels available to American consumers, according to the coalition’s president, Jigar Shah. "Keeping these stiff tariffs in place … prevents more American homes, businesses and utilities from switching to clean solar energy," Shah said in a statement last month. Yeatman said that easing restrictions on Chinese solar imports would align well with her goals. "Lifting these tariffs likely would be as, if not more, conducive to achieving her avowed goal than even renewing the solar panel investment tax credit." Shah praised Clinton’s solar proposal on Monday, saying it "is bold and is something we are on track to hitting by 2020." His group enlisted the services of lobbyists with the Podesta Group to work on "US-China trade relations" until July of last year, according to disclosure filings. CASE remains a client of the firm, which continues to provide public relations services. The Podesta Group was founded by John and Tony Podesta. While the former works directly for Clinton, Tony has bundled nearly $75,000 in contributions for her campaign. He has also donated between $25,000 and $50,000 to the Clinton Foundation. The Podesta Group also represents SolarCity, a leading residential solar panel installer. Clinton emphasized residential solar in her climate plan, declaring that it would "generate enough renewable energy to power every home in America." This entry was posted in Politics and tagged 2016 Election, Center for American Progress, Green Energy, Hillary Clinton, John Podesta. Bookmark the permalink.